As full-time Airstreamers, we're living, not camping. We're willing to make sacrifices for our minimalist lifestyle, but we still want all the comforts of home. Our modern appliances help make our space comfortable and functional. Our fridge is a Dometic RM3762 propane/120V fridge. We have the FridgeFix installed, which vastly improves the fridge's performance—no more frozen coils, no more warm spots, even with the fridge fairly packed. The fridge works fine, and it's very convenient that it works indefinitely off-grid, but we do have some gripes. We were surprised when we received our fridge to learn that RV fridges do not come with the door panels. I bought the "aluminum" door panels for my Dometic fridge, but they're plastic and look kind of chintzy. I might swap them out for custom cut panels of Allclad, maybe with a steel back so that they'd be magnetic. If I had to do this again, I'd take a harder look at Vitrifrigio refrigerators. Vitrifrigio makes 12V marine refrigerators that would work very nicely on a moderately powerful solar setup. They don't need to be vented to the outside, so that would have given us more flexibility in the layout of our Airstream. They also don't burn propane, so they're safer to operate. I can't tell you which we would have chosen, but I wish I had given a DC fridge more thought. We have the 17" tall Atwood propane range, which fits nicely in the space above our dishwasher. Propane works best for our lifestyle because we only have a modest solar setup, so using electricity for cooking is out of the question. The feel and finish of the Atwood range is not impressive. While the door is actual stainless, the front brushed stainless panel under the dials is a sticker. The ignition method is a dodgy piezo ignition that makes a sort of cheap sounding clunk every time you light the burners, and only works about half the time. We keep an aim-a-flame next to our stove as a backup. The oven performance can be vastly improved by adding a pizza stone and turning your baking 180 degrees halfway through cooking. This pizza stone fits the RV oven perfectly. I recommend putting it on top of the rack, and leaving it there. We've driven all over the country with our pizza stone sitting on top of our oven rack, and no cracks or chips yet. I should note that our stove was drop-shipped from Atwood not once, not twice, but three times. The first two times, Atwood shipped it UPS ground, and it was absolutely destroyed on arrival. PPL motorhomes (the vendor we bought it from) was fantastic throughout the process. It was frustrating, but given the circumstances, I couldn't have asked for better service from PPL. If I had to do it again, I'd lean heavily toward the Dometic CU-434, or a marine range like the Force 10, Dickinson, or Eno models. I might still end up with the Atwood since it fits so perfectly above the dishwasher, but I'd give other models a closer look. The Atwood range isn't horrible, but it just isn't as nice of an appliance as I would like. We installed the Precision Temp RV-550 instant water heater. It's performed perfectly to spec since the day we fired it up. It heats water quickly, and the integrated freeze protection is a nice feature that we've been taking advantage of this winter. For our lifestyle, a tankless water heater might not have been the best solution. We boondock a lot, so we don't tend to run the shower water continuously. When we turn the shower back on, it requires some fiddling with the dials to get enough flow going to kick the heater on. That can make off-grid showers a little more complicated than they would otherwise be. It's also worth noting that our dishwasher does not consume water fast enough to kick the heater on. I'll usually hand wash a dish or two or clean the sink while the dishwasher is filling so that it gets hot water. I've rigged up a solenoid valve to dump hot water into the fresh tank to allow me to prime the hot plumbing, and to use a thermostat to heat my fresh tank with propane while off-grid in the winter. I don't have the thermostat hooked up yet. I'll put a note in here once I write a blog post about how that's working for me. I think this would be a fantastic choice for someone with an unlimited supply of water. If you always have full hookups, I highly recommend this unit. If you almost never have full hookups, a small tank style heater might be a better choice. Yes, I put a dishwasher in the Airstream. No, I'm not crazy. 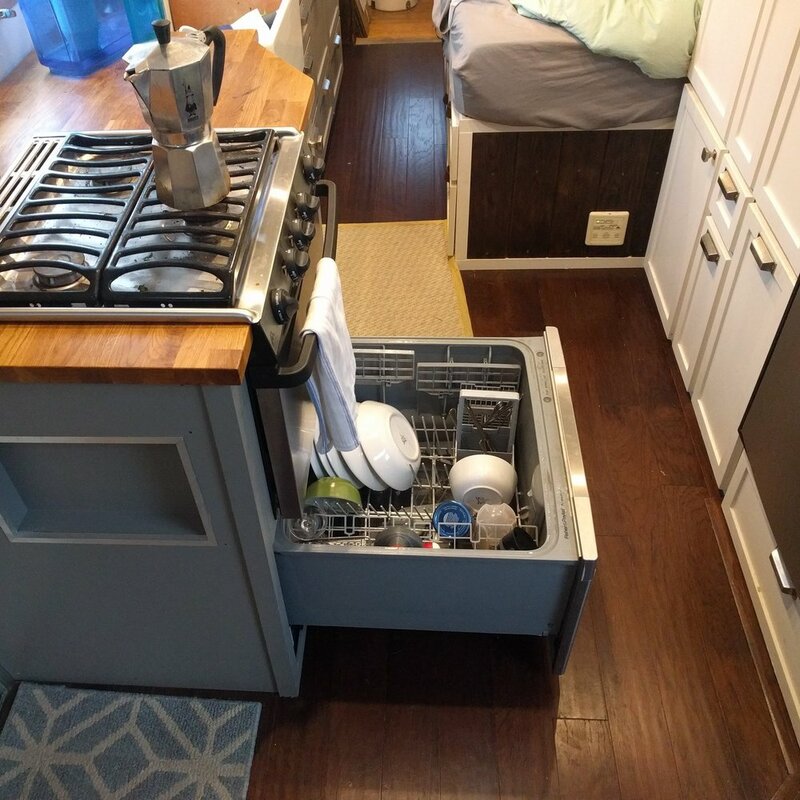 We've been running with a working dishwasher for over a year now, and it's one of the best additions we made to the Airstream. It's a Fisher and Paykel Model #DD24SCX7 single drawer dishwasher. It's about the same size as the bottom rack of a regular dishwasher. It fits perfectly below our 17" Atwood range (the shorter model). With 400 watts of solar on the roof and a tiny 100 AH AGM battery, we've been able to consistently run the "fast" cycle of the dishwasher on solar power. The heating element takes up the majority of the power, so if you make sure the dishwasher is getting hot water, a wash cycle isn't as big of a power hog as you might think. The dishwasher weighs about 57 lbs, but I'm putting it where the furnace used to be, so it's not all extra weight. I originally thought I'd be voiding a warranty on the dishwasher by installing it in an RV, but the manual points out that it's auto-locking feature is designed specifically for boat and RV use. The only real downside is that I can't let it freeze, so I made a slight plumbing modification to make it easy to fill with RV antifreeze if necessary. Our wood stove is one of our favorite parts of our home. It's the centerpiece to our living area, is better to watch in the evening than TV, and is a huge help off-grid because it uses easily obtainable fuel and requires zero electricity. The model stove we have is a Hobbit (with the optional wood storage stand and direct air kit), made by Salamander Stoves. The flue kit was the first run of the 4" RV kit from TinyWoodStove.com (run by Nick of livinlightly.com). We're using a rear exit tee so that we can have the whole top surface for cooking, and two 45s to avoid our Vista View window. We have an extra 20" piece of insulated pipe to make a detachable chimney, and a blank cap to cover the flue while underway. The stove is the heaviest addition to our space. The stove itself is about 110 lbs, and the hearth it sits on will be made of ~25 lbs of 1/4" HardieBacker, about 35 lbs of glass tile, plus some thin set and grout. Maybe 10 lbs for the flue, 15 lbs for heat shielding. Probably around 200 lbs added for the whole assembly. I'm getting rid of some heavy-ish stuff (like a shallow cabinet and a flip-up table) that used to be in that area, but this is definitely a net increase in the weight of the coach. Our heat shield is made of Allclad 3032 aluminum, the same stuff as the Airstream skin. It's riveted in a pattern to match the exterior skin, using some 1/2" aluminum angle to add support, and attached to the fridge wall with 1-1/2" stainless screws and 1" aluminum spacers. It works great—no matter how hot the stove gets, our heat shield is cold to the touch. Our stove is manageable, but if I had to do it again, I might go one size smaller. We have to underfire our stove unless it gets down to the single-digits, so I think a 3kW model might be a little better fit for our space, and it would save on weight. We also could have gone a little tighter with our clearances. We chose the Coleman Mach 8 Cub air conditioner because of its low profile and low power demands. It runs on a 15A receptacle (though not along with anything else), starts right up with our MS2000 inverter, and should work fine with a Honda 2000 generator. Coleman has later released the improved Mach 8 Plus model. The heat works better than expected. It takes a while to warm up the Airstream, but with our upgraded insulation, doesn't have a problem keeping it comfortable in reasonable weather. In practice, though, we almost never use the heat strip. Most of our winter living in cold climates involves moochdocking at Leanne's parents' house, and the heat strip trips the 15A GFCI. We use a 1500 watt space heater instead. We had some hiccups with getting the AC started, but I was eventually able to get Airxcel to send me a warranty part. If you need something from Airxcel, don't waste your time emailing. Just call the tech service line at 316-832-4357. We replaced the forward and rear vents with Maxxfans. The Maxxfan has a low profile, really moves some air, and has a built-in rain cover. We used the manual model for the front living area, and the remote-controlled model for the sleeping area. The Maxxfan takes up several inches of additional space aft of the vent. So, if you have tight clearance from solar panels or something, you might want to measure before you buy. 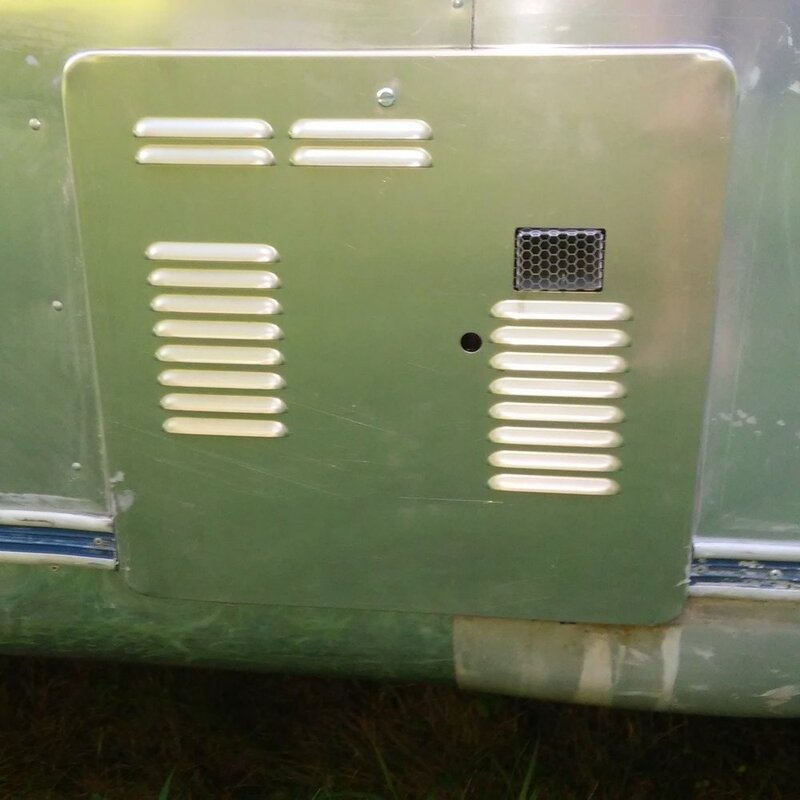 The factory vent holes in my Airstream were the correct size, but I had to cut out the radiused corners to fit the slightly-more-square Maxxfan. Amazon seems to be the cheapest place to buy these last I checked. We replaced the center vent cover with a translucent Lexan lid. This model fits the factory Airstream vent perfectly and lets light through. You must supply your own rivet holes and foam gasket.